The Gran Tursimo 49 combines the pleasures of speed cruising with the sharing of unique moments between family and friends in incredibly glamorous luxury surroundings. She promises memorable moments underway and at anchor. Taut lines and a sporty look, the Gran Tursimo 49 boasts a spirited temperament. On board, the living spaces have been designed to enjoy moments of relaxation and interaction. The large submersible swim platform offers a space to store a jet ski, as well as a large dinghy locker, in which these leisure craft can be easily accessed. A glass door closes off the cockpit to create a second lounge area inside with a panoramic sea view. The opening roof provides perfect ventilation. The galley, located below the lounge, is completely open. It is bathed in light from the windshield. The atmosphere inside is a marriage of walnut wood in contrast to glossy lacquered furniture and padding in shades of taupe, bronze and cream. The opportunities to personalise the boat are many: lacquer colours, worktops, floor coverings, upholstery etc. it is a real pleasure to live on board the Gran Tursimo 49. A large locker to aft provide storage space for a 2.80 m inflated dinghy with its engine in place. The submersible swim platform is designed to take a load of 350 kg: the dinghy or jet-ski can be stored in it when underway. 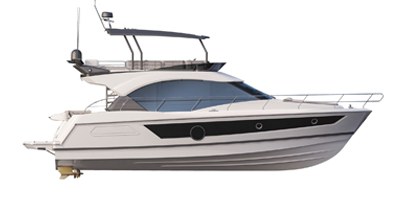 Designed to be highly responsive, the Gran Tursimo 49 has a Volvo IPS 600 (2 x 435 HP) engine. Of international repute, this makes manoeuvring smooth, increases efficiency and lowers fuel consumption. Now expert in this field, Beneteau was the first brand to develop a hull specific to this type of engine. The owner and guest cabins have a king-size bed and bathroom ensuite with separate shower. The GT49 comes in a choice of two or three cabin versions. In the two cabin version, an additional lounge is situated below the saloon, providing a private cosy space. The Gran Tursimo 49 galley is spacious and bright and fully fitted. It has lots of clever storage spaces including the ingenious ‘magic corner’. This makes cooking on board a real pleasure! CE Certification B14 - C16. Large L-shaped cockpit saloon seating 5 people. Large forward sun lounger with folding backrest. To aft,, the cockpit table lowers to create a second relaxation space. Volvo IPS 600 engine (2 x 435 HP). Submersible swim platform (1.20 m) where a dinghy or jet-ski can be stored. Designed to take a 350 kg load. Locker for 2.85 m dinghy inflated with engine in place. Outdoor galley, TV Hi-Fi and bar furniture. Spacious saloon with choice of two table positions: cocktail (low) and dinner. Driving station with space for full electronics (2 x 12" screens). Opening port lights and side glazing, ventilation. Owner cabin with king-size bed, panoramic windows, ensuite bathroom. Guest cabin with panoramic windows, ensuite bathroom with separate shower. Third cabin with two twin beds. Fully fitted galley, lots of clever storage spaces including the 'magic corner'. 270 L refrigerator/freezer. Owner cabin with king-size bed, panoramic windows, ensuite bathroom. Guest cabin with panoramic windows, ensuite bathroom with separate shower. Lower L-shaped lounge facing the galley.